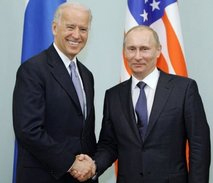 March 10, 2011: Prime Minister Vladimir Putin proposed to visiting US Vice President Joe Biden that Russia and the United States take the “historic step” of abolishing visas between the two countries. “If the United States and Russia agree to implement a visa-free regime before Russia and the European Union, then this would be a historic step in our relations,” Putin told Biden. Efforts by Russia and the European Union to agree visa-free travel between the two sides have continued for years without making substantial progress. This appears to be the first time Putin has suggested cancelling visas with Moscow’s main Cold War foe. British Petroleum (BP) is under increasing pressure over its disputed joint venture with Russia’s state-controlled oil firm Rosneft. Recently, former BP CEO Tony Hayward missed a crucial board meeting, causing speculation that he may disagree with BP’s handling of the contentious deal. In January, BP announced the signing of a joint Arctic exploration deal and $16 billion share swap with Rosneft, which the Kremlin billed as confirmation of the West’s continued business interests in Russia. If successful, the tie-up would see BP gain a 10 percent stake in Rosneft and the Russian company receive a five percent stake in BP. Russia successfully tested a second prototype of its revolutionary new “fifth-generation” fighter plane: a futuristic, ultrafast, and stealthy warbird that may be in the possession of the Russian Air Force by 2013. If Russian claims about the Sukhoi T-50 multirole fighter are true, then the country that has made do with Soviet-era arms for the past two decades is poised to roar into the 21st century with a cutting-edge weapons system that is so advanced and complex that only the US has been able to field one.